*eghemmm* Could somebody drop me some beats, please? Rap with me, now. Hope you guys channeled your inner Mix. Bremelo is indeed a less-than-flattering reference to a type of lady from our fair city, immortalized in song by the great Sir Mix-a-lot in 1988. 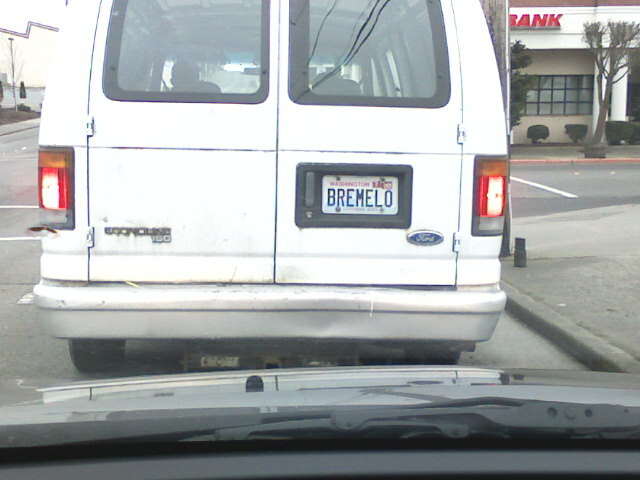 Love it or hate it, this guy’s celebrating a slice of Bremerton’s pop culture heritage, I can’t deny. I am sort of disappointed by the van. I would expect a much more bootylicious pimptastic ride than that van. Don’t be so quick to judge, Jake. We don’t yet know what kind of carpet lines the inside of this bad boy. You’re funny. Are you channeling Andy Binion, reporter? Remember Andrew Binion, that alert reporter who asked Dr. Boyd for a copy of the documents concerning the Superintendent retire/rehire? And I certainly hope that a Code 911 item isn’t where we learn about said lining, Rebecca (though I’ll concede the generous odds of that happening). Karen, I might be guilty of channeling Mr. Binion. I don’t have any expertise in the Bremerton superintendent issue, but I know reporter Rachel Pritchett has continued following it. Well, you are funny. And a poet. Excuse me for going off topic. It just occurred to me that the story might have unfolded differently if an alert Kitsap Sun reporter had missed the meeting, missed the documents being disseminated, or chose to ignore it. There are a lot of discussions on the internet about the future of newsprint and journalism. This story is an example of the need for good reporters. Thanks for the verse. And the nostalgia. Karen, you are right, that is defiantly one way the BSD story would have played out differently. Another is if Dr. Hyde had just come out and asked to School Board upfront for a $30K raise based on her award winning performance. The entire conniving, sneaky, misleading song and dance of this past year that was set in motion with a lot of help from Dr. Boyd to get her more money could have been avoided. Tonight’s meeting is sizing up to be another session where they pull another “fast one” on the Bremerton Community. Several of us will be there watching..stay tuned.